So I suppose having hoarding tendancies could be considered a good thing when money is one of the things you hoard. As my finances clearly show, my “condition” isn’t too bad. 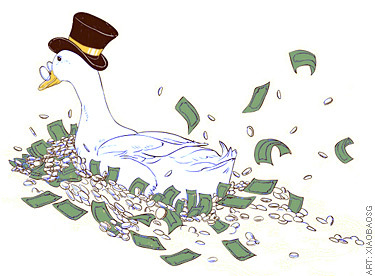 If I were totally insane, I’d be swimming in cash like Scrooge McDuck. But I do have some “investments” that aren’t really performing (and never will) that I’m reluctant to let go of — even when I fully understand the money could (and should) be more wisely used elsewhere. I’m talking about the I-Bonds. Sure, my bonds are earning over 4% right now — a lot more than most — but I don’t own enough of them for that high earnings rate to amount to much of anything. On the flip side, though, I’m carrying almost $25k in credit card debt. And as of last month, nearly half of it is at what I’d consider an obscene interest rate. One could fund the other. A few weeks ago, I took a baby step and sold off around $1200 of the bonds to help pay for the auto repairs and a family vacation that we took. I’m kinda sad cause I really wanted to hit the $10k mark for some reason and now that seems a bit out of reach. But it’s time to cut the cord. Frankly, I was never terribly fond of the TreasuryDirect website with its early 1990’s interface and ridiculous login procedure. Good Bye I-Bonds, Hello Stocks! I-Bonds are a Decent Investment again, right? I know this guy who lives in Wesley Chapel in Florida and he is hoarding over 3 million dollars cash in the home for one thing it is not at all in a safe or in any way is the home protected. In fact you could sneak up the back of 25453 Aptitude Terrace as the back is up to water and no security to the home or neighboorhood it just a stupid idea but the guy has like 6 million to his name and now he is worried about the banks and the IRS getting his cash, plus he has an ex wife that he has tried like hell to cheat out of every penny he possibly could. I dated the dude and I can tell you this is a dumb idea to keep this much money in the house.